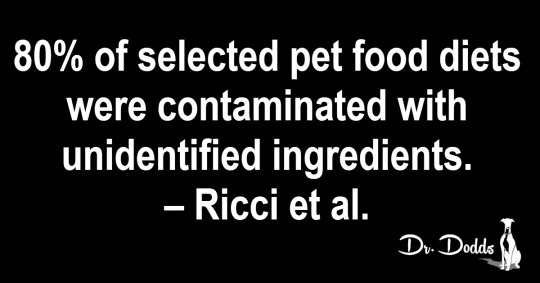 80% of selected pet food diets were contaminated with unidentified ingredients. – Ricci et al. 3 out of 4 diets claiming “no soy” were positive for soy. – Willis-Mahn et al. 14 out of 17 diets had significant levels of animal protein that were not listed on the label. – Maine et al. 20 out of 52 samples were deemed mislabeled since they contained an unidentified meat species and/or did not contain meat species that were listed on the product label. – Okuma et al. 4 venison diets were tested for beef and soy. 3 out of 4 were positive for soy but did not list soy on the product label. One tested positive for beef even though beef was not listed on the ingredient list. – Raditic et al. Why these pet food studies should be of concern to pet owners. Besides feeling outrage and deceived by pet food manufacturers, pet owners should be more concerned by the potential implications on their pet’s well-being. Dogs and cats that have pruritus or gastrointestinal discomfort due to food sensitivities are particularly at risk as they do not have a chance at optimal health. Secondly, pet caregivers who make an effort to avoid certain foods or rotate proteins may inadvertently be doing what they did not intended. Why is the mislabeling of pet foods occurring? Cross-contamination can occur via transport and storage containers and/or manufacturing equipment because they were not thoroughly cleaned. Mixing hoppers that use forced air can contaminate nearby products with airborne particles. Co-manufacturers or co-packers produce pet food products for small and large companies and can possibly mix up the ingredients. Suppliers are not disclosing ingredients accurately either purposefully or unintentionally. For instance, ethoxyquin may be present in fish meal but this is not disclosed to the pet food manufacturer by the fish meal supplier. through the end meat protein to cause a reactivity. The large and complex supply chain is shaky. Lack of quality control or testing of end products by the pet food manufacturers. It can be assumed that pet food manufacturers are overwhelmed by the whole process and do not know where to start. At the end of the day, they are simply not testing the final product or even randomly testing for quality and label adherence before the food leaves the facility. On top of that, the Food and Drug Administration (FDA) does not require testing for ingredients. Why pet food mislabeling doesn’t lead to recalls. In the United States, the Congress simply has not instructed or funded the FDA to lead a misidentified pet food initiative. The FDA is charged to ensure that human foods do not contain top allergens such as soy, wheat, milk or nuts, for which it barely has the funding to stay on top of that. The agency also needs to make sure bacteria such as Salmonella and Listeria monocytogenes are not present in any foods. In fact, the reason why pet foods are recalled for Salmonella and Listeria monocytogenes is not to protect the dog or cat, but to protect the human potentially handling the pet food. What can pet parents do to avoid the misidentification dilemma? The pet food industry generates billions of dollars every year and its vast network probably uses more products sourced globally than locally than human foods do. The good news is The Association of American Feed Control Officials (AAFCO) is concerned. Unfortunately, I do not see change happening any time soon. Overall, my only recommendation is to home cook human ingredients for your pet to guarantee the outcome. If home cooking is not a viable option for your lifestyle, I have written some quick tips to help you navigate this vast network. Production facilities should produce human foods, too, or are not co-manufacturers or co-packers for pet foods. Supply chain is known and accounted for. The source country of all ingredients should be fully disclosed. Preferably, all products meet local governmental standards for human consumption. For instance, the meat should be USDA grade. Make sure ingredients are grass-fed or organic. Allred, Laura K., PhD. “Are Your Petfood Labels Accurate?” Pet Food Industry, 27 Aug. 2012. Web. 13 Dec. 2015. Okuma, Tara A., and Rosalee S. Hellberg. “Identification of Meat Species in Pet Foods Using a Real-time Polymerase Chain Reaction (PCR) Assay.” Food Control 50 (2014): 9-17. Print. Willis-Mahn, Christine, Rebecca Remillard, and Kathy Tater. “ELISA Testing for Soy Antigens in Dry Dog Foods Used in Dietary Elimination Trials.”Journal of the American Animal Hospital Association 50.6 (2014): 383-89. Web. A special thank you to Susan Thixton of Truth About Pet Food for helping us identify potential causes of food contamination.